Why should Hamsters have all the fun?! 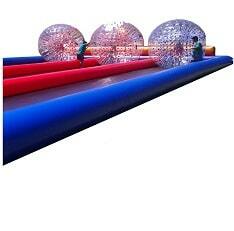 Looking for Zorb balls, or "Zorbies" in San Diego? We got them! Now you can experience the hamster life without all that messy bedding or drinking from an upside-down bottle! Our Zorb ball race includes a 75ft long 3-lane track, 3 Giant Hamster Balls and 2 staff members to move the action along. Its the perfect party idea for school carnivals, church festivals and corporate picnics in San Diego! Capacity: 1-3 participants, up to 200lbs per ball. Max 600lbs. Minimum space: 78L x 38W x 10H. Supervising Adults: 3 - Company attendants included in price.